Writing your medical fellowship personal statement is not a simple task and it is not something that you can afford to relax about. Often this can be the deciding factor in your selection. Thankfully our professional services can offer you everything from a sample medical school personal statement to professional help and advice with your fellowship application. Often a candidate’s experience and qualifications can be pretty similar to many of the others applying. The admissions committee will also know that you have to be pretty good to have gotten this far. So they need the personal statement to be able to choose between you. They also want to see far more about you than just what grades you have gained; they want to see just how well you are going to perform in their program with the team that they have. Our professional services will be able to help you with all aspects of applying to ACGME accredited fellowship places through ERAS. While your medical school is busy uploading your data through EFDO we can support you with ensuring that everything from your resume to your personal statement is completed to perfection. Getting the attention of the admissions committee and impressing them is vital if you are going to get your place. This means that you need to spend a considerable amount of time preparing your personal statement for research fellowship application. You need to review what their expectations are by carefully reading everything that they provide for applicants. Each program will have very precise ideas of what they want in a fellow. What was it that got you interested in your specialty, was there some specific experience that influenced you? Did your decision to enter this field come from a mentor that has had a significant impact on you? Did you have a specific patient encounter that has shaped your interests? Have you faced specific adversity in your past that has helped to shape your current interests? Is there something else in your personal background that has driven you towards your current choices? What is it about this field that holds your interest? What theme can you choose to use that will provide you with a clear storyline on which to hang your personal statement? Don’t boast at others expense: telling the reader how you did better than another or how others fell flat on their face is not going to make you appear as the best team member for their program. Don’t give information that you shouldn’t: observe confidentiality rules fully even when writing your personal statement. Don’t complain: complaining about past tutors and programs or anything else is not going to help you to win a place. Don’t talk yourself up: simply saying that you are a great team leader is not going to help you, if you want to show yourself in this light give an example of you in the role. Don’t romanticize the field: they will be looking for someone with a realistic view of what they will be doing and what their future career will be. How Can We Help with Your Residency Personal Statement Writing? 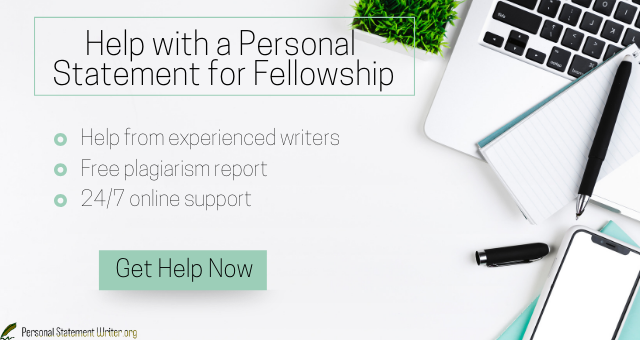 Our fellowship and residency personal statement writing service has been supporting applicants for many years. We fully understand all aspects of applying through ERAS and getting ranked well for the Match as well as tailoring applications for specific programs. With our support you are guaranteed to get the help that you need to be able to submit your personal statement with pride. Direct contact with one of our experts: you will work one on one with our writer to ensure that your statement fully reflects you and is tailored to your application. Experts that are qualified to help: your writer will hold a relevant postgraduate degree as well as many years of experience. Unlimited changes: if you feel any revisions are required to the personal statement drafted they will be made until you are fully satisfied. Free proofreading and a free plagiarism report: we guarantee that your writing will be unique to you and free from any mistakes. Fully confidential: we will not share your personal statement of other details with any other. Highly affordable: you will find it difficult to find a service with a similar quality for this price. Get to work with our professional team today to ensure that you have the best chance of selection with a perfectly written medical fellowship personal statement!